Mary H. Krout : Surf Riding in Hawaii, 1900. 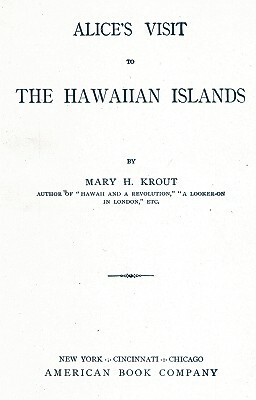 In this book for young readers Krout acknowledges that although she had visited Hawai'i, some of her work is based on previously published works. Such is the case of the surfing content, which is mostly written in the past tense. However the illustration, signed Gleeson on page 48, was possibly prepared for this publication. 1891 W.D. Alexander : A Brief History of the Hawaiian People. 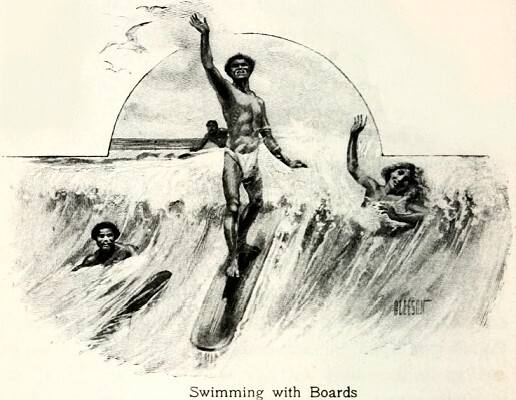 1896 Thrum*(Hawaiian Annual) : Hawaiian Surfriding. Judd, Laura Fish: Honolulu; Sketches of Life, Social, Political and Religious, in the Hawaiian Islands from 1828 to 1861. Anson D. F. Randolph, New York:, 1880. In writing this imaginary journey to the Hawaiian Islands I have described the country and the people as they were studied by me during two actual visits. The volcano of Kilauea was at the time of my visit in a state of great activity, and the account which I have given of the wonderful spectacle was prepared from notes written within sight of the crater. Among books that have been especially helpful in the preparation of this work have been J. J. Jarves's "Hawaiian or Sandwich Islands," W.- D. Alexander's " A Brief History of the Hawaiian People," Mrs. Judd's "Honolulu," Mrs. Isabella Bird Bishop's "Six Months in the Sandwich Islands," and "The Hawaiian Annual." The Hawaiians made little sledges with curved, polished runners and coasted down the grassy hillsides. They also played at bowls and threw spears at a target ; and the chiefs were fond of shooting mice with bows and arrows, a sport in which no one else could engage. They ran races and wrestled; and in their boxing matches struck such heavy blows that men were frequently killed. The most popular of all their pastimes was swimming. themselves upon the swimming board and were borne swiftly to the shore. They were so skillful in this dangerous amusement that they were rarely hurt or drowned. They were also very fearless in leaping over high waterfalls, into the deep pools below. Indeed, they spent so much time in the streams and the sea, that they were almost as much at home in the water as on the land. Few of the Hawaiians of to-day would venture to leap over even a small waterfall, and they rarely use their swimming boards. 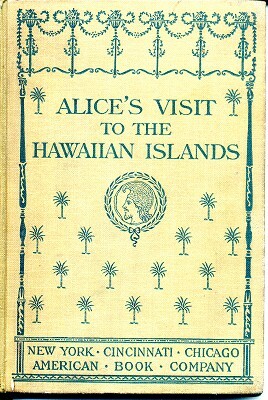 Geoff Cater (2012) : Mary H. Krout : Alice's Visit to the Hawaiian Islands, 1900.